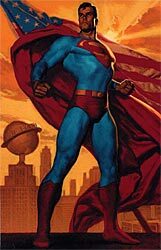 Truth, Justice & The American Way was created and painted by famed DC artist Glen Orbik depicting Superman as the Man of Steel with the rooftops of Metropolis in the background. Orbik is revered for his realistic images. He uses live models during the creative process to capture true human musculatures and poses. Orbik is also known for his work on The Punisher series and book illustrations whcih include The Life Story of Flash. Orbik’s unique style is also used on the 40’s and 50’s era DC Comics Vertigo series. This art is approximately 29 by 17 inches unframed. This fine art Limited Edition Giclee is an edition of 250 works of art on paper, each hand-signed by Orbik and includes Warner Bros. Certificate of Authenticity.